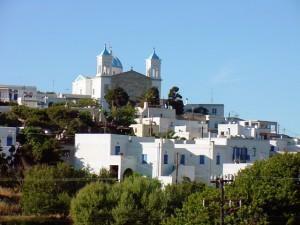 This inland village has several very lovely churches to explore, plus a couple of excellent tavernas. A beautiful old villa was recently renovated and is now an art gallery featuring new exhibitions every summer. The Exhibition House, as it is called, also has a lovely garden area where drinks are served. From the village of Falatados, you can reach the nearby villages of Steni and Myrsini, both with lovely churches. From Myrsini, you can climb to the top of Mount Profitis Ilias, or take the dirt/paved road to the beach of Livada. From Steni, you can continue on to the farming village of Potamia (what a setting! ), then further along to the beach of Santa Margarita. Walkers will find a path leading from Falatados down to Volax, and from Volax to Agapi. This is a lovely nature walk and not too strenuous.